We sponsored the Lab Rescue Charity Golf Tournament on April 14th at Wentworth Golf Club. The Labrador Retriever Rescue of Florida is a volunteer organization committed to rehabilitating, rescuing and placing Labrador Retrievers in permanent homes. 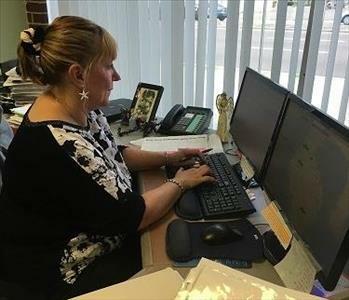 Their mission is made possible by dedicated volunteers and donors. It was a good time for a great cause! 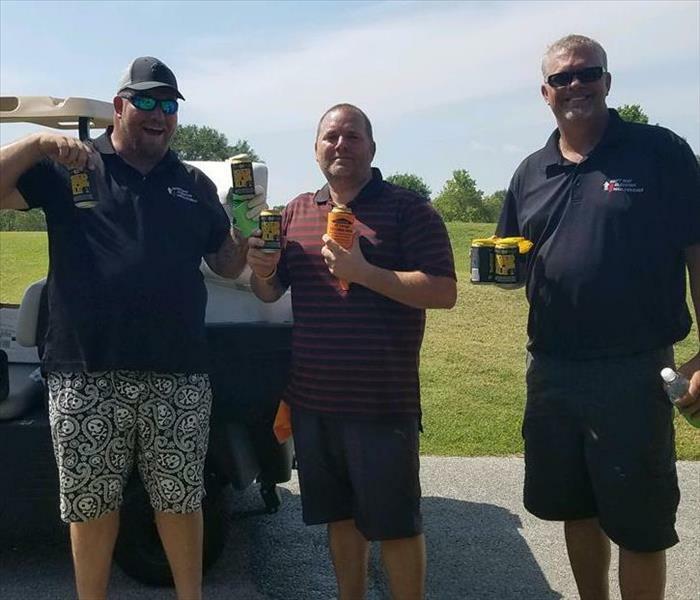 SERVPRO of Largo was excited to sponsor and support the 6th Annual Relay for Life Golf tournament in memory of Robert C. Reinhardt. The charity tournament was played on two courses this year, Bardmoor Golf Club and Bayou Club. Thanks to everyone who came out for a fun day of golf. We are already looking forward to next year's tournament! 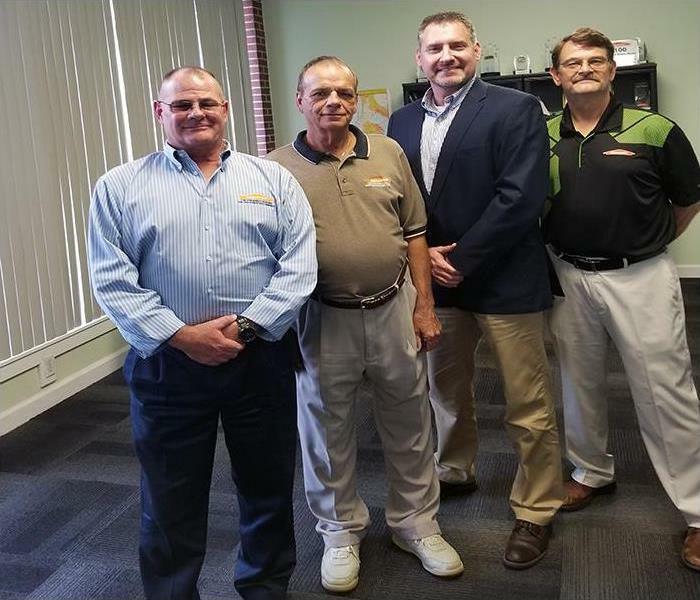 Our team at SERVPRO of Largo had an excellent meeting with Rob Reynolds of SERVPRO National Accounts. In 2018, we plan to increase our Insurance Claim referrals. 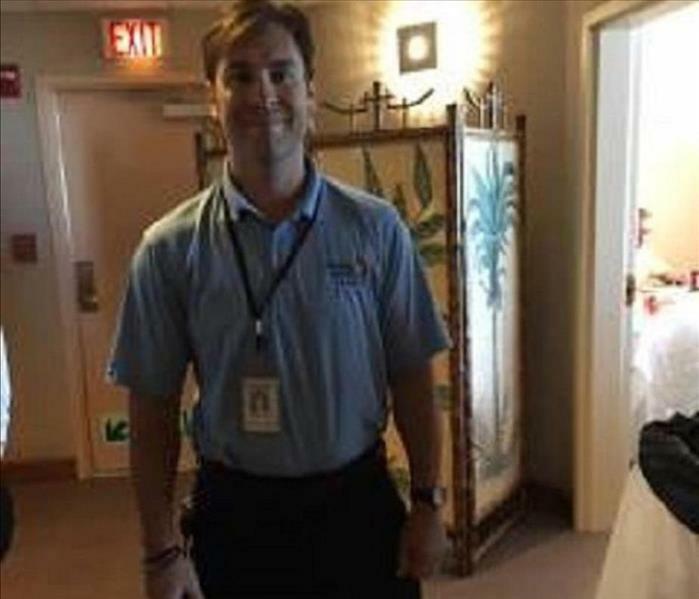 We are the best in the industry when it comes to restoring and cleaning your commercial or residential property. 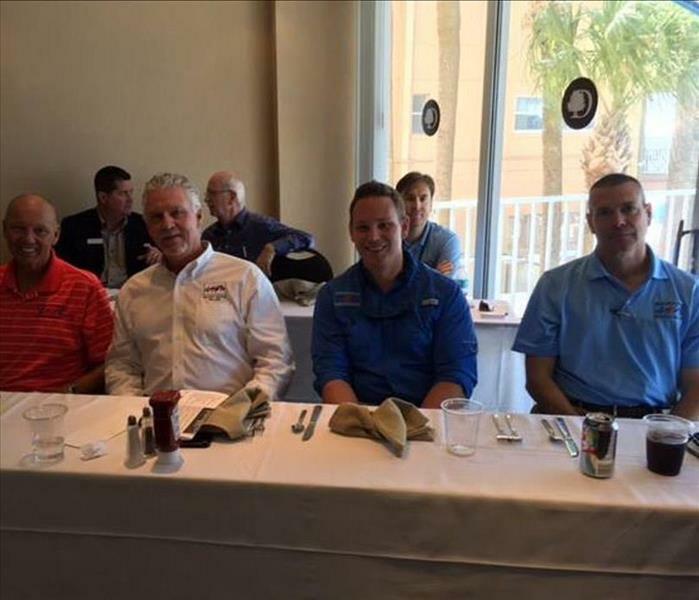 Pictured from left to right is Buddy Greenway, Michael J. Smith, Rob Reynolds, & Mike Wolfe. Thank you to everyone that came out and participated in the CE 'Understanding Mold' class. Some of the topics that owner, Buddy Greenway, discussed were water losses, mold remediation, preventing damage to properties, and avoiding liability. We even had a great Q & A session at the end. 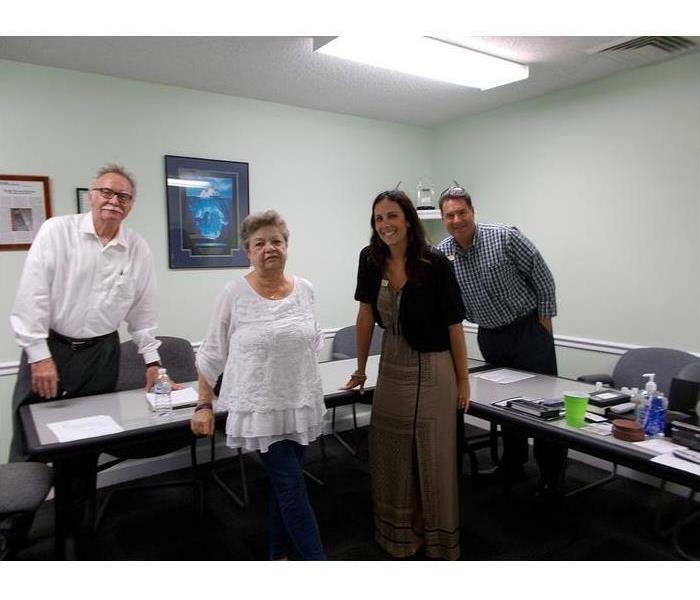 Our SERVPRO of Largo team looks forward to continuing these education classes in the future! Deanna Greenway volunteering her time for a great cause! SERVPRO of LARGO is a proud sponsor of Resource Property Management "Relay for Life" Fight Against Cancer Golf Tournament. This year's event was held at the beautiful Bardmoor Country Club in Largo, Fl. We set up our tent and donated gift bags and snacks. It was a great time for a great cause!! Practicing for the Putting Contest! 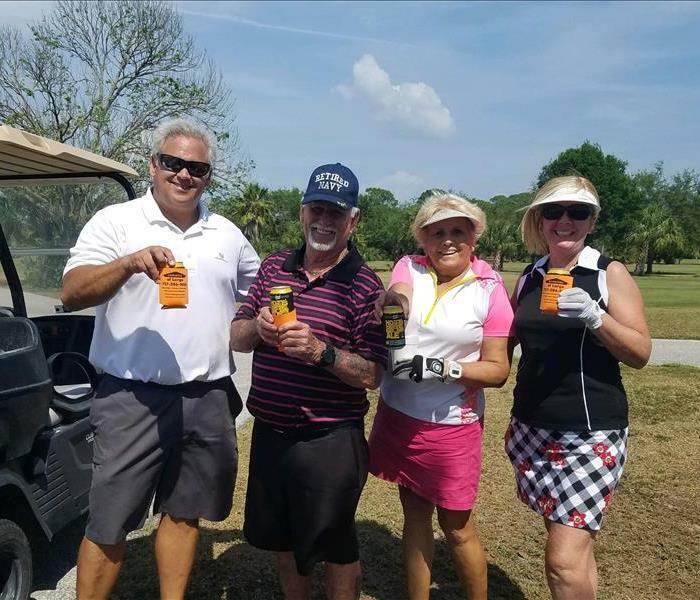 The SERVPRO of LARGO team was a proud sponsor of Resource Property Management "Relay for Life" Fight Against Cancer Golf Tournament in Largo, Fl. Te event included a Silent Auction, Raffle Tickets, Low “Team” Score Award and Putting Contest. A good time was had by all. Thanks to all the sponsors, volunteers and players. Having Fun for a Great Cause! Our SERVPRO of LARGO team was a sponsor of Resource Property Management "Relay for Life" Fight Against Cancer Golf Tournament. We are participating in the American Cancer Society’s Relay For Life because we want to make a meaningful difference in the fight against cancer. It was a great time for a great cause. We are aways ready to support the local community. Allen Greenway "monitoring" the situation!! 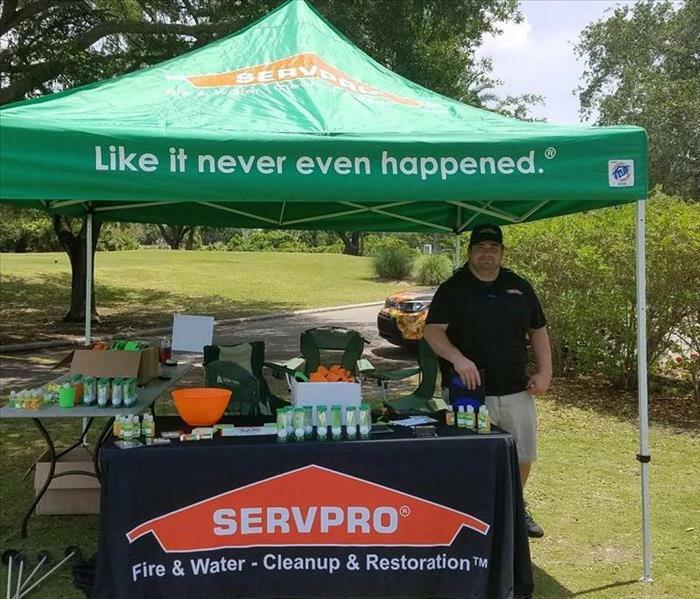 When our SERVPRO of LARGO team is not providing emergency restoration services 24 hours a day, 7 days a week, we are happy to volunteer at the Resource Property Management "Relay for Life" Fight Against Cancer Golf Tournament. We set up our SERVPRO tent with donated gift bags and snacks. As a local company, we support local charities. 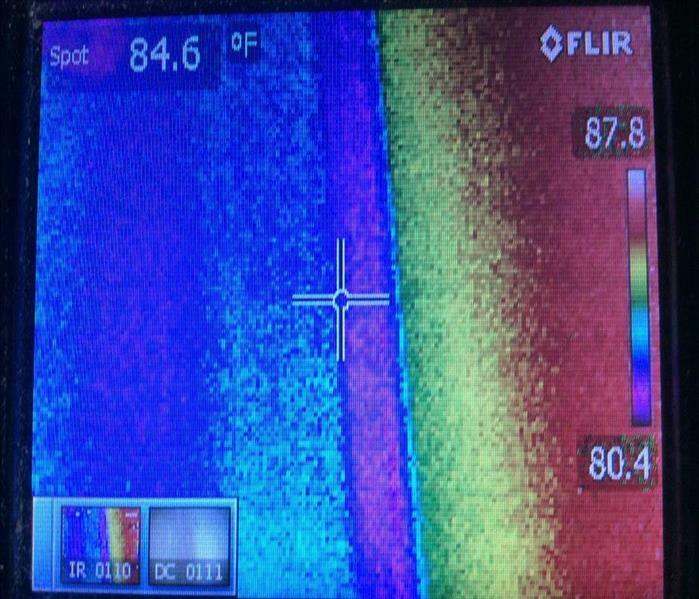 Call us for water, fire or mold damage restoration in the Largo area. 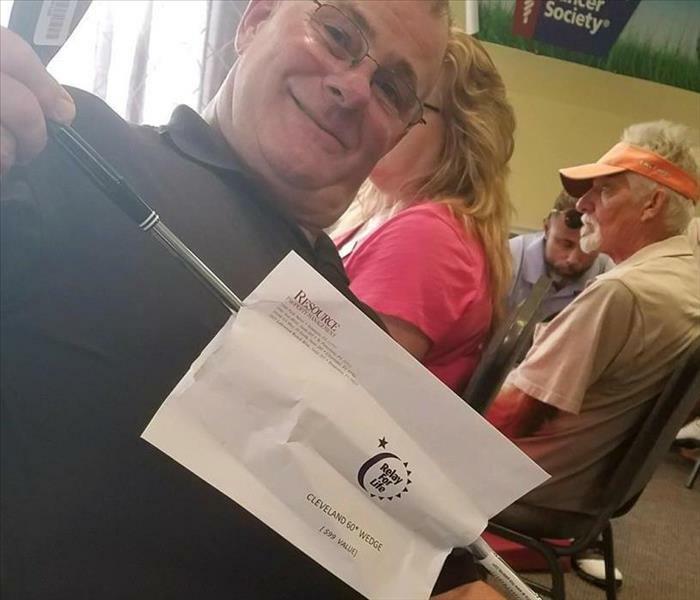 Buddy Greenway wins a new Chipping Wedge!! SERVPRO of LARGO sponsored the Resource Property Management "Relay for Life" Fight Against Cancer Golf Tournament. The event was held at Bardmoor Country Club in Largo, Fl. Golfers enjoyed a Longest Drive Contest (prize for Men & Women) and Putting Contest. Plus a HOLE IN 1 CONTEST for $10,000 CASH AND PRIZES including a CHANCE TO WIN 3 FREE FABULOUS TRIPS. Congratulations to all the winners. Enjoying some donated "Hooties Craft Ale"
The SERVPRO of LARGO team provides emergency fire, water and mold restoration services. 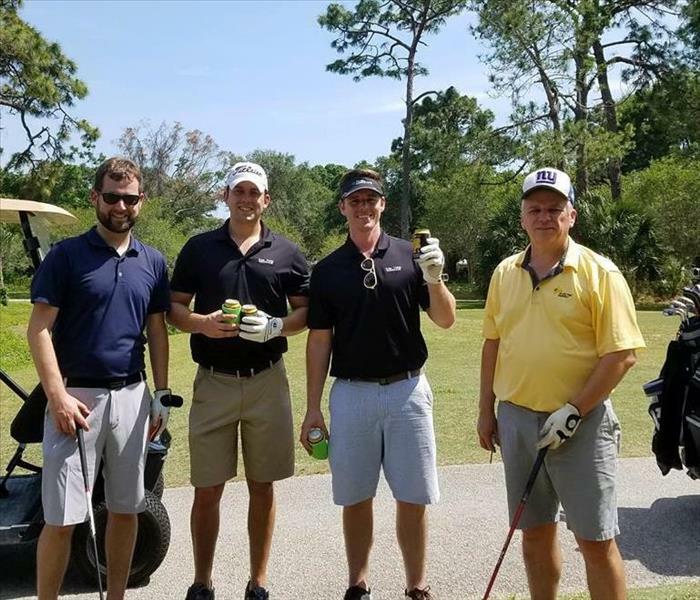 Recently we sponsored the Resource Property Management "Relay for Life" Fight Against Cancer Golf Tournament at Bardmoor Country Club in Largo, Fl. Many sponsors, volunteers and players participated to help raise awareness and much needed funds. Thanks to all who participated and made it a great event. The Drink Cart Went That Way!! 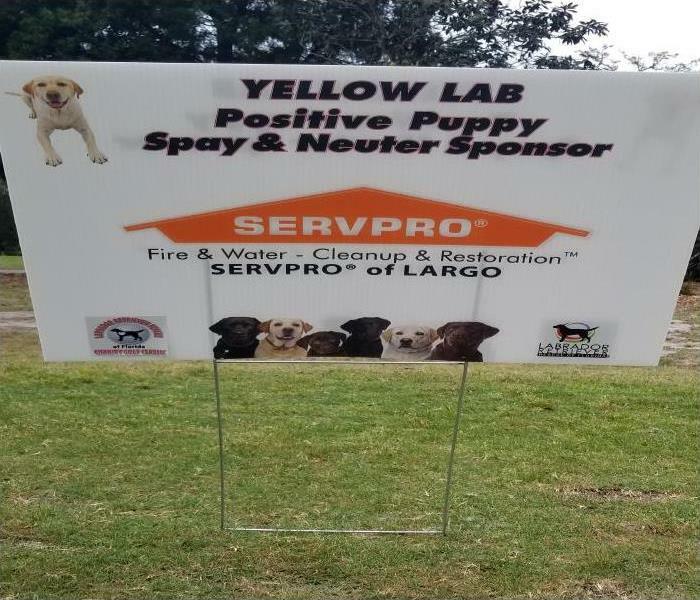 SERVPRO of LARGO was a proud sponsor of Resource Property Management "Relay for Life" Fight Against Cancer Golf Tournament. The event was held in Largo at the Bardmoor Country Club. We had our SERVPRO tent stocked with gift bags and snacks. It was a great time for a great charity. The impact we can make together is much greater than what any of us could do alone. We are always happy to help the local community. 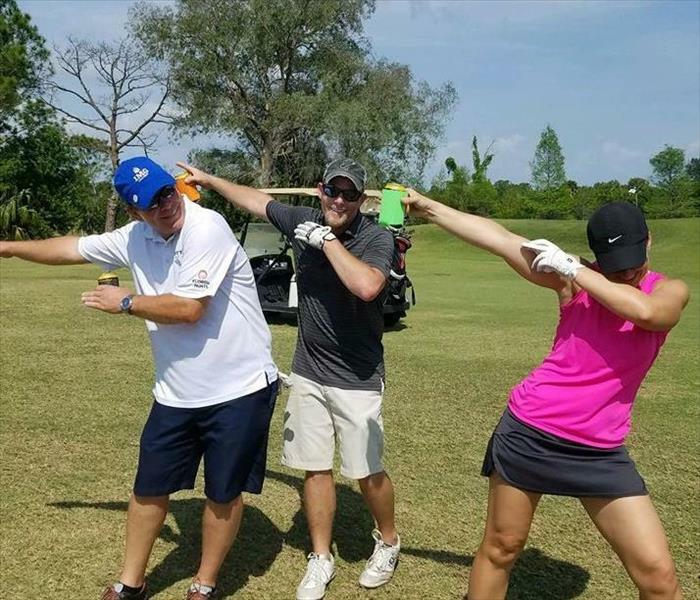 Recently our SERVPRO of LARGO team sponsored the Resource Property Management "Relay for Life" Fight Against Cancer Golf Tournament. Each person who shares the Relay For Life experience can take pride in knowing that they are working to create a world where this disease will no longer threaten another birthday. As a local company, we are always ready to help local charities and our neighbors. Thank you to everyone who came out to help the fight against cancer. We all appreciate your support. 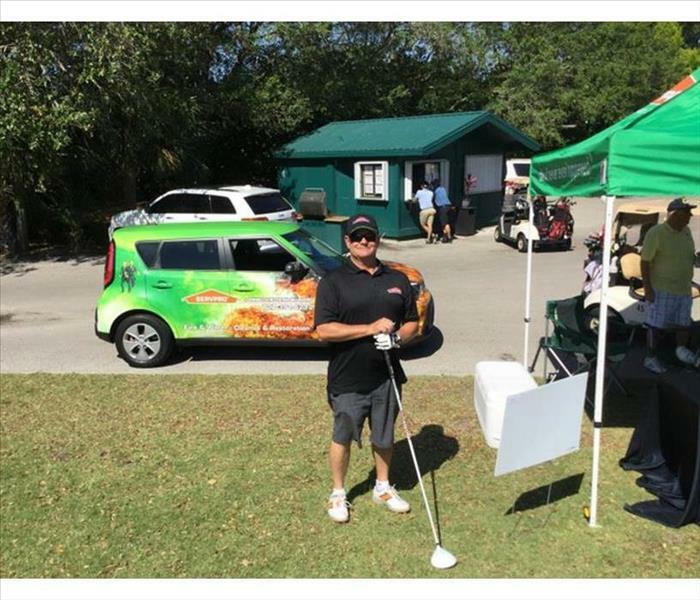 Our Proud SERVPRO of Largo owner Buddy Greenway is pictured in front of a company "Golf Cart" at the CAI golf tournament hosted at the Bardmoore Country Club. 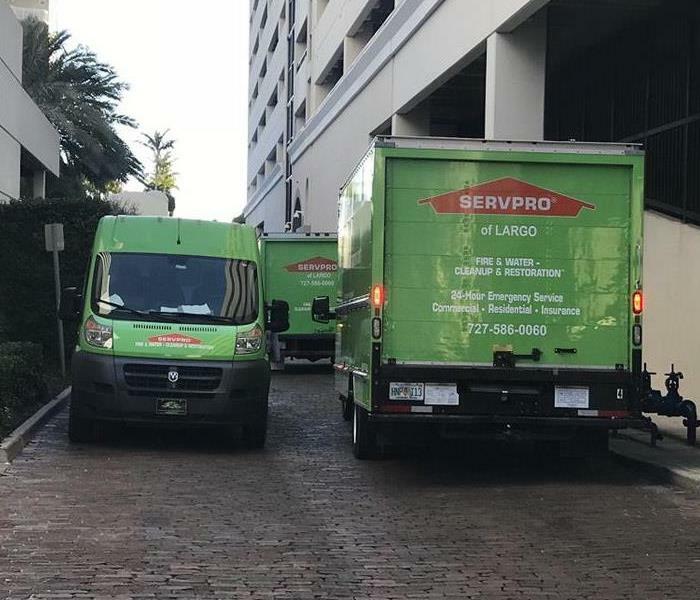 The Community Associations Institute relies on SERVPRO for support of its programs and for our help in providing water, fire, and mold cleanup and restoration services to its members. 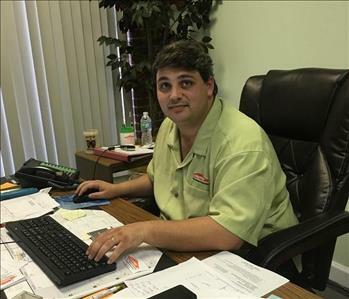 With over thirty years of experience in helping distressed properties, Buddy "drives" for customer satisfaction and contributing to the well-being of our communities. SERVPRO of Largo owner's Buddy and Deanna Greenway having a wonderful time at Seminole bowling lanes, helping the National Alliance on Mental Illness of Pinellas County with the NAMI Bowl 2016. SERVPRO of Largo is a proud sponsor of this event! Held at our training center at 1569 S. Missouri Ave. Clearwater, FL on 2/18/2016. 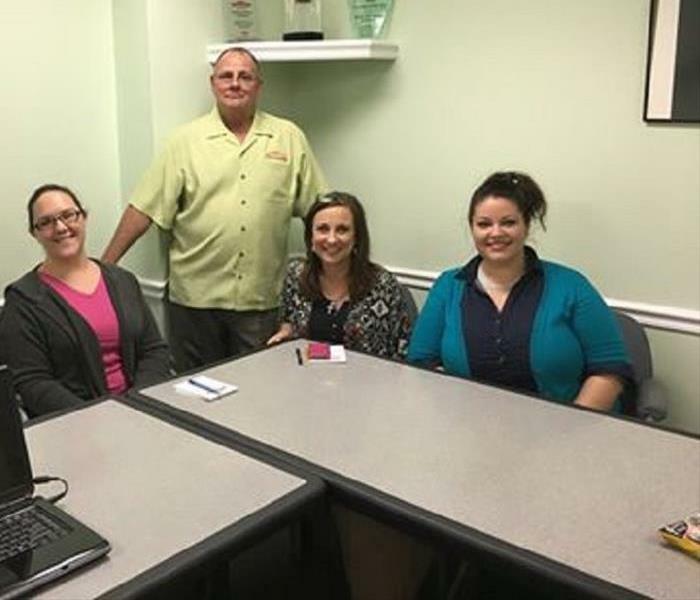 These young ladies representing a local insurance company, had a blast at SERVPRO of Largo's Continuing Education Class (Mold) with instructor Buddy Greenway. They were very curious about what causes mold, how long does it take for mold to grow etc...They got all of their questions answered and more! Come join us for an informitive and fun CE Class. Call (727) 586-0060 and sign up for the next class! Deanna Greenway co-owner of SERVPRO of Largo, passing out goodies as a proud sponsor for Resource Property Management's "Cure for Cancer" golf tournament at Bardmoor Country Club in Largo. It was a beautiful day for golf and a great opportunity to raise awareness for the fight against cancer. Special thanks to Phil Brigman and staff for their efforts to make this event a sucsess!